I bet when you were looking through the catalogue at all the pretty patterned paper, you saw the Wood Textures Designer Series Paper and thought ‘huh’. Well, it looks cool; wonder how I can use it? Perfect for backgrounds, of course. But what else? Well, I saw a card somewhere – I’m not sure whether it was Pinterest, or Facebook, or one of the Demonstrator pages, that had a great idea for using this paper. 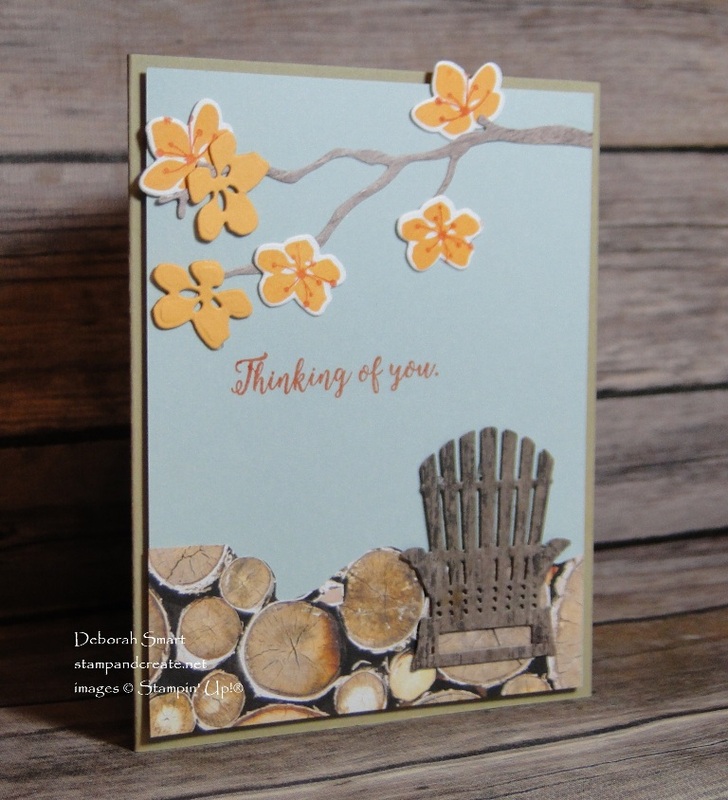 Well, aside from die cutting the chair using the Seasonal Layers Thinlits Dies from one of the Wood Textures DSP Stack, I created a wood pile! There are 4 each of 12 double-sided designs, and one of the designs is stacked wood. I decided what approximate height I wanted the wood pile to be, then used my Paper Snips to cut around some of the logs. There’s my wood pile! I glued it to my panel of Soft Sky cardstock, then attached the die cut chair. On Whisper White cardstock I stamped some flowers using the Colorful Seasons stamp set. They were die cut, along with the branch, using the Seasonal Layers Thinlits. After they were attached using a combination of Liquid Glue and Dimensionals, the whole front panel was attached to the Crumb Cake cardstock card base. 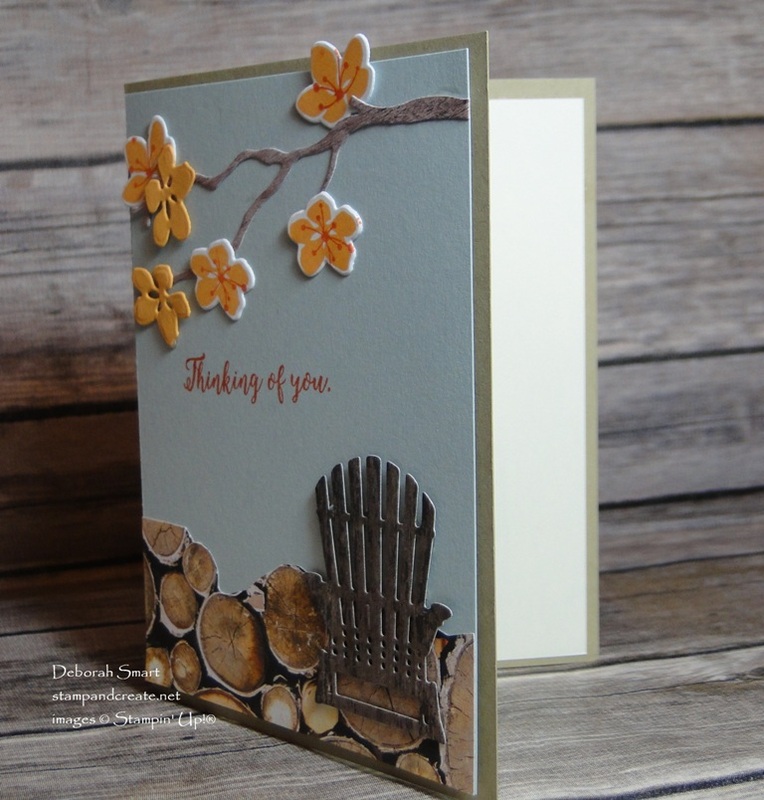 So on this one card, I used the Wood Textures Designer Series Paper for 3 items. The wood pile background, the chair, and the branch! 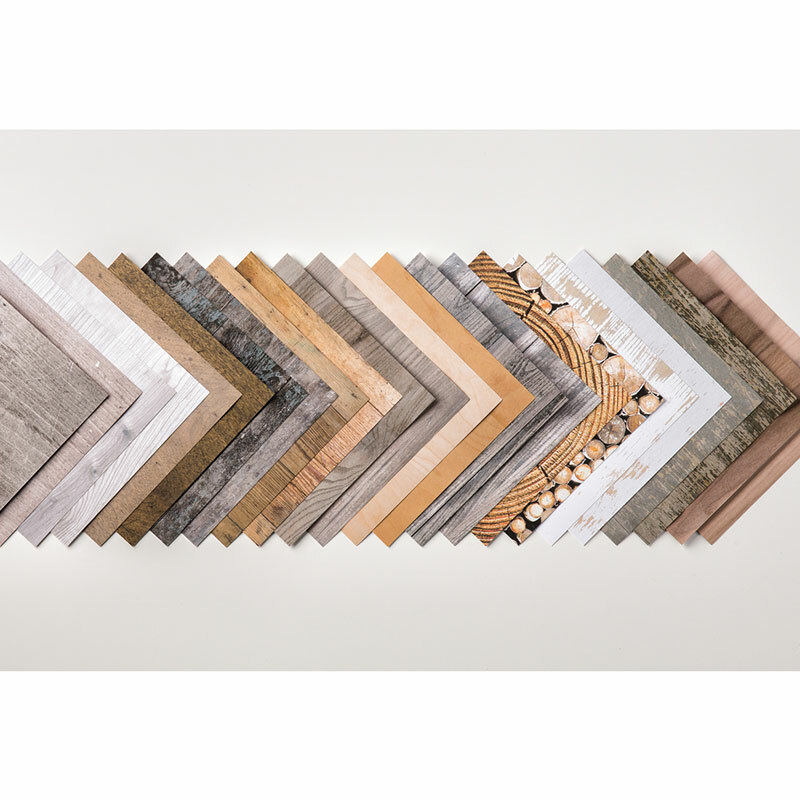 It also works great with the Wood Textures Suite, which can be found on pages 158 – 159 in the Annual catalogue, or just CLICK HERE to see it now! I hope you’ve enjoyed seeing my card! To order your own supplies, just click the images below. Love, love, love it! Thanks so much for sharing. So clever! Great card, Deborah!